CONCERNS ABOUT HEALTH AND SALT USE HAVE FUELED SALE OF SEA SALTS, BUT ARE THEY REALLY DIFFERENT? It’s hard to talk about health and salt in the same sentence, but every once in a while something comes along that forces the issue. This time it’s sea salts. The pitch being made by promoters is that sea salt contains all of the other minerals found in sea water, while regular table salt is processed to remove them. They claim those minerals are what make sea salt a healthy salt. What Makes Sea Salts Different? All salt comes from the sea, so technically, it’s all sea salt. Some is evaporated from today’s oceans and salt water lakes, some is mined from deposits left from evaporated sea beds that are thousands of years old. When first collected the salt contains a variety of minerals, such as sulfate, magnesium, calcium and potassium. Table salt is processed to remove the trace minerals and environmental impurities to create a product that has a consistent composition, size and taste. Anti-clumping agents are added to many commercial brands so the salt flows freely. Iodine may also be added to provide a needed source of this essential mineral. The first thing you’ll notice about see sea salt is that is isn’t always snow white. The color comes from the impurities that remain in it, like clay and volcanic ash, and the trace minerals. The next visual difference is the size of the crystals. They’re much larger than table salt, more like kosher salt, so don’t expect them to come out of a standard salt shaker. If you put a few crystals on the tip of your tongue, you’ll find they don’t dissolve instantly. When they do, the taste may be milder or stronger than table salt, depending on the variety you’re sampling. Professional chefs say sea salts provide a fresher flavor to the foods they are added to, but you may not notice the difference. Now for the big difference: Price. Sea salts cost anywhere from 2 to 10 times more that common table salt! Do Trace Minerals Make Sea Salt a Healthy Salt? All of the other minerals found in sea salt are necessary for good health, but there are not enough of them in a teaspoon of sea salt to make it a useful source. And there are plenty of other ways to get those minerals, specifically from vegetables, fruits, whole grains and low fat dairy products — all foods we need to eat more of. The most abundant mineral in sea salt is sodium. In fact, sea salt has the same amount of sodium as table salt, and that’s the problem. Dietary guidelines recommend reducing sodium consumption to lower blood pressure and risk for stroke. Sea salt offers no advantage over table salt when it comes to lowering sodium intake. To see whether people might use less sea salt than table salt due to the texture and taste differences, researchers at the University of Guelph in Canada designed a study to measure that. They published their findings in Food Research International and reported subjects did not use any less. Their conclusion was sea salt was not a viable option for reducing sodium in the diet. What this means for anyone looking for a way to enjoy good health and salt is this: Use less salt no matter how much you pay for it! The ingredients we use to sweeten our foods and beverages come from a wide variety of sources and have many different features and names. In some cases, the only thing they have in common is that they all taste sweet! Some are ingredients found on our pantry shelves while others are already in the food and drinks we consume. Some have names we cannot easily pronounce while others are words we use in our everyday speech. And the list goes on. There are so many terms used to describe the sweeteners available to us that it’s easy to become misled into believing some are better than others. We have all these terms because the ones used by the scientists who study sweeteners are different from those used by the food safety agencies that approve and regulate their use. And the terms used by health professionals who counsel people about the role of sweeteners in the diet differ from the ones used by the companies that sell them to us. 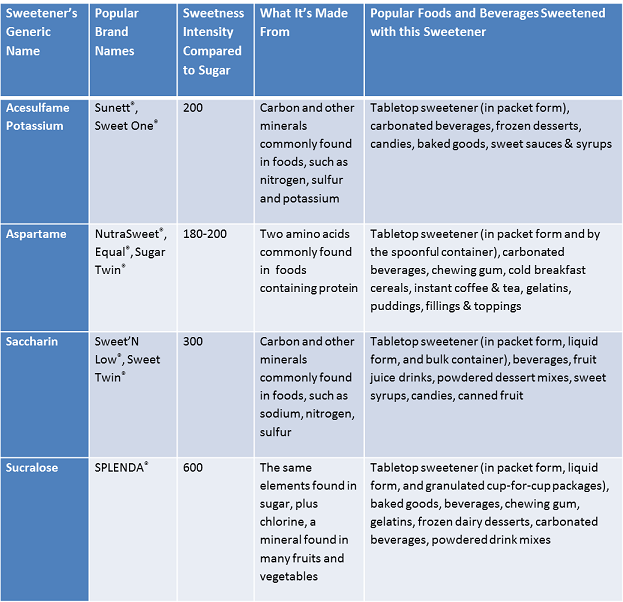 Given the heightened awareness of “added sugars” in our diets with the release of the 2015-2020 Dietary Guidelines for Americans and the expected appearance of “added sugars” on the revised Nutrition Facts label due later this year, it seems like a good time to review just what we mean when talking about the sweeteners we consume. The main way all sweeteners can be classified is by whether or not they contain calories. The scientific terms used to describe this distinction are “nutritive” sweeteners, which contain calories, and “non-nutritive” sweeteners, which do not. This list includes the terms permitted by the US Food and Drug Administration (FDA) for approved food additives and ingredients, as well as those that are Generally Recognized as Safe (GRAS). This list also includes other terms that have crept into common usage but are not clearly defined by any official source. You may want to print out this list and keep it in a handy place so you won’t be confused the next time you’re reading a food label. What’s New in the 2015 Dietary Guidelines for Americans? The new guidelines encourage us to limit our daily added sugars intake to less than 10 percent of our total calories as part of a healthy eating pattern. To figure out what your daily limit for added sugars is, you first need to know what your daily calorie requirements are. You can use this table in the Guidelines for an estimate of your daily calorie needs based on age, gender and physical activity level. Once you know how many calories per day you should eat, take 10 percent of that number to know how many calories you can devote to added sugars. Now you must divide that number by 4 to determine the number of grams of added sugars you should try to stay under each day. Another option is to divide the sugar calories by 16 to calculate the daily number of teaspoons that shouldn’t be exceeded in your diet. To stay within your allotted budget for added sugars you should keep track of the grams and/or teaspoons of added sugars consumed each day, along with your total daily calories. Unfortunately, one of the biggest challenges with this step is that added sugars are not labeled on the nutrition facts panel of food products. Ingredients are listed by weight with the one used in the greatest amount coming first, so if an added sugar is at the end of a long ingredients list on a nutrition panel it is most likely not present in a significant amount. Foods and drinks made with no- and low-calorie sweeteners, like SPLENDA®Sweetener Products, typically have less added sugar than their full sugar counterparts. The more types of sugar there are in the ingredient list, the more likely their combined weight would appear higher on the list. limit or decrease the portion size, or choose unsweetened or no-sugar added versions of grain-based desserts (cakes, pies, cookies, brownies, doughnuts, sweet rolls, and pastries) and dairy desserts (ice cream, frozen yogurt, pudding, and custard). Let SPLENDA® Sweeteners Help You Reach Your Goal! An easy-to-incorporate strategy I recommend is to replace some of the added sugars in your food and beverages with high-intensity sweeteners (also known as sugar substitutes or low-calorie sweeteners) like sucralose (the sweetening ingredient in SPLENDA® Sweetener Products) to retain the sweet taste that is such an important part of our eating experience. Replacing some added sugars with high-intensity sweeteners is a smart way to reduce added sugars in the diet while providing the sweet taste we want. For example, instead of the typical sweet tea with a peanut butter and jelly sandwich, you could try this Hot Spiced Tea and spread some No-Sugar Needed Triple Berry Jam on your sandwich. Using SPLENDA® Sweeteners or other high-intensity sweeteners instead of added sugars is a strategy that can produce big results at the end of the day without doing all the math. For example, just by substituting one can of diet soda for a can of regular soda automatically eliminates 10 teaspoons of added sugars from your day no matter what other changes you may make. Adding a SPLENDA® No Calorie Sweetener packet instead of 2 teaspoons of sugar to three cups of coffee a day removes six teaspoons of sugar from your tally. And preparing this Berry-Cherry Pie with SPLENDA® No Calorie Sweetener, Granulated replaces one cup of sugar in the traditional recipe (or 6 teaspoons per serving). There are probably a number of other changes you will need to make to limit the added sugars in your daily diet. But being able to continue enjoying a little sweetness in your meals, with less added sugars, should help make those changes a lot easier to achieve. To learn more about Sugar Substitutes, visit the Sugar Substitutes section of this blog. A simple ruler may hold the key to preventing holiday weight gain this season. You’ll need it when unpacking the festive plates, glasses and utensils you use for all your holiday parties and meals. As indicated by the research cited below noting the size of that dinnerware can help you control the size of the portions you eat. Choosing a smaller plate or bowl is one way to limit portion sizes according to a study published in the Journal of Consumer Research. The research found that using smaller plates can decrease serving size by up to 10% with a corresponding reduction in the number of calories served. If your holiday place settings are super-sized, this may be a good time to pick up some smaller-sized pieces to add to the set to provide the options you need. I found a nice selection of smaller plates and bowls at the discount store that worked well with my tableware, and I got them at a great price, too! When eating in a restaurant or someone else’s home you typically don’t have a chance to pick your own plate, so other strategies are needed to control food portions. The most important one to remember is that you do not have to eat everything on your plate – or multiple plates if served multiple courses – no matter who prepared the meal or is paying for it. And if questioned about why you didn’t finish be prepared to politely, but firmly, tell your host how delicious the food was, but you simply had enough. You can then ask to take the unfinished portion home. Always use a small plate to serve yourself hors d’oeuvres at parties to avoid taking food from platter to mouth where it’s easy to lose track of how much you’ve eaten. Choose an appetizer for your meal when eating out and complement it with a salad and/or side vegetable. Alternatively, share an entrée in restaurants and get your own appetizer or salad to start. Use a salad plate at buffets and don’t put more than three different foods on it at a time, so you must get up and revisit the buffet line if you want more food. Ask the server for a “primo piatti” portion of pasta, or first course, instead of an entree portion. Do Fat Free Dressings Block Nutrients in Salad? Hold the trash! It’s not time to discard all those bottles of fat free dressing you have stored on your refrigerator door just yet. Yes, a study done at Purdue University did make quite a splash this week with its report you absorb more of the nutrients in your salad if your dressing contains fat, but it didn’t tell the whole story. What we really got was another example of the kind of research that proves why you shouldn’t change your diet based on a single study. The researchers wanted to see what type of fat and how much of it produced the biggest change in blood levels of certain fat-soluble phytonutrients. Their study included 29 healthy subjects who had to eat 9 salads containing baby spinach leaves, chopped tomato, and shredded carrots, each with a different type and amount of dressing. The dressings were made with 3 types of fat: canola oil for its monounsaturated fat, corn oil for its polyunsaturated fat, and butter for its saturated fat. The amount of dressing on each salad provided either 3 grams of fat, 6 grams, or 20 grams. This made a total of nine different salad samples. After the subjects ate each salad, their blood was tested to measure their absorption of carotenoids. Carotenoids are compounds with names like lutein, lycopene, beta-carotene and zeaxanthin that are found in plants and have numerous health benefits. Because carotenoids are fat soluble, they are better absorbed when consumed and digested with fat. As expected, higher levels of carotenoids were found in the subjects’ blood after eating salads with the higher amounts of fat. This held true for all three types of fat. The best absorption of carotenoids for the least amount of fat was seen with the canola oil, or monounsaturated fat. The study did not tell us what would happen if you ate other foods containing some fat along with those salads or put some fat-containing foods on them. Good nutrition science says you can use a fat free dressing and still absorb the carotenoids in your salad as long as another source of fat is consumed around the same time. I have been advising clients for decades that a salad is not a meal unless you add some protein and a greater variety of vegetables than were included in this study. I also know that anyone who tries to get away with eating a plain salad and fat free dressing for a meal will not last long. Fortunately (in this case), the snack they reach for shortly afterwards will probably be high in fat. So if you like to toss your salads with olives, nuts, avocado or cheese; top them with egg, chicken, salmon, tuna, falafel, steak or bacon; or follow them with lasagna, beef bourguignon or chicken tikka masala, go ahead and use that fat free dressing. Your carotenoid levels will be fine. How many different dressings to have in your house?